Director of Byzantine and Post-Byzantine Monuments. Professor at the Faculty of Philosophy of the University of Athens. The editorial board of the periodical, Orthodox Witness, which is the publication of the Pan-Cypriot Society of Orthodox Tradition, "The Friends of Mt. 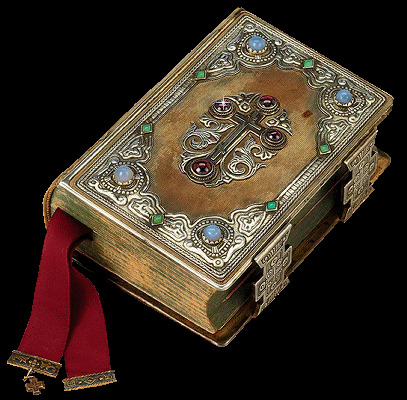 Athos," has kindly granted us permission to publish in this volume the following text entitled, "Fr. 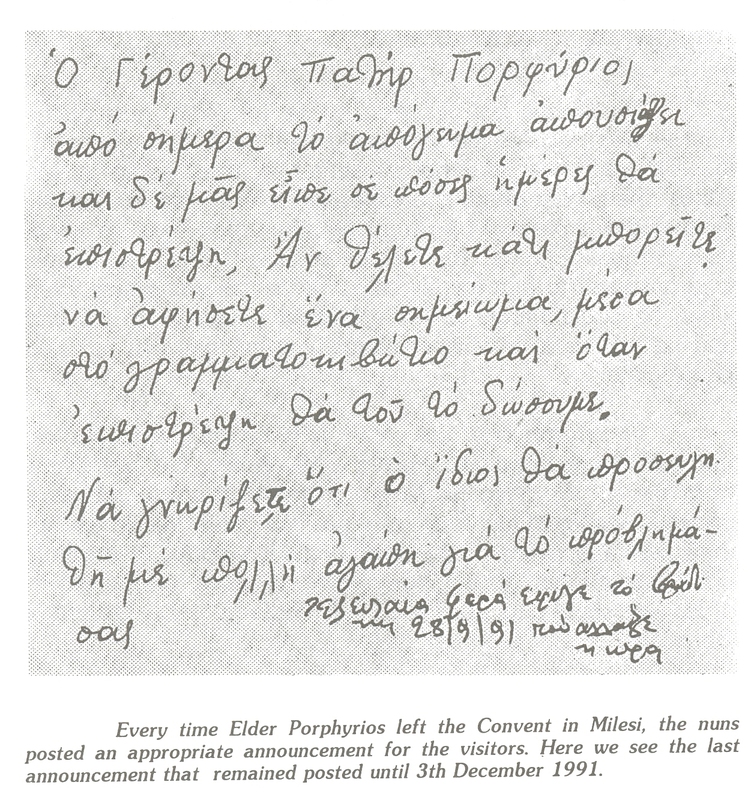 Porphyrios, the Elder of Penteli" The same text was also published in the periodical Synaxis, Athens, January-March, 1992, pages 84-88. It is published here with additions and changes by the author. We met, my wife and I, Elder Porphyrios on the Mountain of the Blameless, Penteli, the calmest and friendliest mountain of Attica. An Athonite Abbot first told me about the Elder. He was experienced in the spiritual life, but also know­ledgeable about the multifarious problems of contemporary life in the world. In spite of all of this, we started off with certain reservations about meeting this monk in Penteli. Fr. Porphyrios lived in some makeshift little cells at St. Nicholas in Kallisia, a holding of the Monastery of the Holy Trinity, Penteli. In order to get to St. Nicholas, you must park your car in a clearing and from there you must walk for a little less than half an hour. The path begins on flat ground. Then it narrows and you walk almost on the edge of the rocks. Beautiful flowers surround the hiker. Further on, after you descend an incline and cross over a small stream, you enter into a shady forest of fir trees. Later you ascend again and when you pass near some ruins, you find yourself in a rocky, treeless area where a monastery had been built three hundred years ago. Today the main thing remaining is the charming little domed Church of St. Nicholas. As you walk on the narrow path, you are slowly cut off from the dirt and noise of Athens. Without realizing it, you enter another world. During the day, the city below stretches out its cloudy laziness. At night, the lights often flicker in the distance. In Kallisia there is no electricity. Candles and a few church lanterns light the faded forms of the Saints and the bare rocks. Oil lamps dimly light the cells. There is a small guest house where, during the winter, heat is produced by a wood-burning stove. The only presence of 'technology' outside the cells: a taut wire used as a radio antenna. During the winter, Fr. Porphyrios snuggled up to the wood-burning stove. In the summer, he walked out on the small platform of rocks or in the little gardens that he cultivated in the lower areas of the monastery grounds. When the weather was good, he heard confessions in the Church. Then, as we first went there, we waited outside in the courtyard, making acquaintances with people that we met for the first time. We quickly felt an unexpected friendship and softness in our hearts. Maybe it was the internal need and an ache, functioning as a connecting element, that directed us all to the mountain, where we awaited help. The first meeting with Fr. Porphyrios was very quiet and friendly. It was a meeting without any of the gloominess or austerity that one would imagine when hearing about an ascetic Elder. He listened to the pointed revelations of unstable souls with calmness and understanding, as if they were like common daily chats. It was as if he knew. A sense of peace and cheerfulness filled the area around us and softened our souls. In our first meeting, all the inhibitions we previously had about him were dissolved. There was no inhuman strictness. There was only brotherly love and forgiveness. He listened while praying with his prayer rope. He blessed and he forgave. "A spiritual father is a great thing" he would say to us later. "This is why there is no despair in Orthodoxy. There is no impasse, because there are spiritual fathers who have the grace to forgive." He began to tell us simple stories about people who found freedom in confession. The Elder's redeeming word, in the lightness of his presence, in the silence of the afternoon, calms our hearts. In many of the expeditions that follow in the evening, in the morning, at night and at noon, pappouli awaits us. Every time the heart feels burdened, the horizon and the road appear closed, pappouli awaits us. Every time we venture forth upon a rocky path filled with brilliant flowers, pappouli awaits us and greets us with a smile. He is agile, cheerful and ready to release the burden from our hearts in a methodical way, guided by his limitless love and the abundance of divine grace which overshadows him. He is charming in the true sense of the word. He had childlike goodness and paternal wisdom. One springtime afternoon, we found him tending to the strawberry plants while practically lying on the ground. He picked some strawberries and offered them to us so that we might taste the fruits of the earth. We talked there. Without giving much advice and moral instruction, he cut deep into the soul and sprinkled the balsam of the God's grace upon it. At times like that, he glowed, shone and rejoiced like a child. He spoke to us continuously about the Prayer of Jesus, about noetic prayer. At another time, he spoke to us and explained to us the meaning of the blessing from a priest and the kissing of his hand. "The hand of a priest," he said with amazement and ecstasy. "What an important thing, eh? what a mystery!" He spoke simply and humbly, emphasizing and repeating that he is not very educated. "Second grade of elementary school." One evening, we had gathered a group of people to meet with an Athonite monk. It became dark. The weather was rough and threatening. However, next to the Elder, even those who had not gotten used to the dark side of nature did not disturb the tranquillity. The Elder was talking about the difference between humbleness and an inferiority complex. The humble person, he said, is not a fragmented personality. He is conscious of his situation but he has not lost the essence of his personality. He knows his sinfulness, his insignificance and he accepts the observations of his spiritual father and of his brothers. He is sorry but he is not despondent. He grieves, but he is not defeated; he does not get angry. Whoever is ruled by an inferiority complex, outwardly and at first glance appears to be humble. If you admonish him or if you counsel him, then his unhealthy ego rebels, gets shaken up and he loses the little sense of peace that he had. He said the same thing happens with pathological depression in connection with the repentant sinner. "The depressed person turns inward and concerns himself only with himself. The sinner who repents and confesses comes out of himself. This is the greatness of our faith, the confessor, the spiritual father. So, you've told it to your elder, don't turn back." He stressed that a great deal. Not to dwell on the past, but to move forward. How many prisoners in the dark land of depression did he save at the final hour by releasing them with the power of his presence before God! He also gave great importance to fasting without being extreme and overdoing it. He simply underlined its cleansing purpose. Conversations with Elder Porphyrios touched various issues. In fact, sometimes he would provoke our amazement at the breadth of his interest. One summer afternoon we were in a hurry to leave. I told him the reason. We were going to attend a concert at the Herodian Coliseum. I brought it up almost on purpose to see his reaction. I was dumbfounded when he knew the composer and the conductor. He spoke with me in a most informed way about the subject. This pappouli of the Second Grade! I also spoke to those who had gone to him a long time before I did and who knew more details about the Elder. I asked them why the antenna was there. I learned that the Elder, at one time, was engaged in the building of some type of receiver made with galena. In addition to cultivating gardens, (which his advanced years and his sensitive health did not allow him to become involved in) he undertook technical projects. I also brought up the subject of the wood stove. It was his design. We gathered around this stove on wintry days and had interminable discussions. Each one of us was waiting for his turn to see the Elder. While this was going on, Miss. Hariklia (the present Abbess Porphyria), the sister of the Elder, prepared coffee and other treats. Theologians, clergymen, Greeks, Serbs, judges, philosophers, doctors, teachers, professors, and students would gather there like a family. There was such warmth, such a sense of fellowship there, that even if the stove went out, we would not feel it. We would often ask the Elder about decisions and choices in our lives. He always had an answer, sometimes expected and sometimes unexpected. He did not recommend resigning from and distancing oneself from activity. He insisted on doing something. He insisted on a simple way of life in the country. He considered a walk on the mountain to be valuable recreation. The late Panagiotis Nellas, director of the well-known Greek Orthodox review "Synaxis", frequently asked him things with regard to his periodical and he always received the correct answer. It is known that Fr. Porphyrios had the gift of foresight and discernment. Many would go to him for confession and he would reveal their deeds. However, he would use that gift with great discretion and only for pastoral reasons. He used it only when it was absolutely necessary. Occasionally, when he was very well disposed and he took those long walks in order to take a little rest, he would ask, with his gracious smile, about the different localities of the people who were in his company. Although he had not been there himself, he would interrupt the person and continue the description. That gift also gave him many worries. Many people misunderstood the gift he had and went to see him without repentance and faith in God. They simply went there out of curiosity or to learn about the future. The Elder naturally took the appropriate position. Sometimes, though, people who started out with such cunning intentions found their faith and salvation in the Elder. Another temptation was from certain heretics or from deluded people (like speaking in tongues, etc.) The Elder was very firm about the cults that prevail in Christianity. The Elder was unyielding and categorical in such cases. He bluntly marked out his position, discrediting their delusion and condemning the heresy. He always emphasized that the only road to salvation is the Church, not 'movements' that were 'personal' and the such like. Father Porphyrios offered the word of salvation and gave rest to souls, simply. He did not have some preprepared program, talks, 'displays' etc. By simply sitting on a rock or lying down on the ground, he would reveal to us the mysteries and the truths of faith and of our spiritual life. He would tell us about the great importance of prostrations and he would show us the proper way to do a prostration. He would explain to us the involvement of the body in prayer and the unity of the psychosomatic dimensions of man that he considered fundamental to the existence, the type, but also the healing of illness. He glowed with childlike joy when he spoke about noetic prayer. With his clear, weak voice, accompanied by graceful hand movements, he would say the words one at a time: "Lord, Jesus Christ, have mercy upon me." He would add something else to this type of conversation, "God gave me the grace to be greatly occupied with this 'work'." He called the prayer of the heart 'work.' "This work is very useful for the faithful. It cleanses the soul and sustains the intellect (nous)!' In all of his conversations, he said something about the prayer of the heart. Later, before his monastery was built in Milesi, he dreamed of having a suitable place where he would spend all his time with this work. The most important work was actualized in the sanctuary of each person's soul. This remains closed to interpretation. It is known only to God and to those who accept the benevolent breath of divine energy. These things are neither talked nor written about. However, others also see dramatic changes in people, who looked like they had reached into the depths of the abyss and are now transformed into children of the light. During the last years of his life, he spent most of the time in bed. Besides, he was sickly and weak throughout his life. This, however, did not prevent him from going to Mt. Athos often, very often, and especially to the inaccessible cell. Neither did it prevent him from fighting, often hand to hand, with demons in order to free the souls of tormented people who hastened to him for his help. He was always serene even when he could hardly talk. He blessed people from his bed and he told us in a whisper about how he thinks of us and he prays for us. Fr. Porphyrios has now left for Heaven, passing through the Gateway to Heaven, Mt. Athos. He blesses us from there. We keep his sacred memory in our hearts as a precious legacy. Our souls are pacified with the image of meekness and peace of the small-bodied pappouli in the little black woolen hat, who God granted to these end times in order to shore up the souls of contemporary Orthodox Christians. "Elder Fr. Porphyrios is absent from this afternoon and he did not tell us in how many days he would return. If you want something, you can leave a note in the mail box and when he returns we will give it to him. You should know that he himself will pray about your problem with much love." To which someone added a reminder of the date. 'The last time he left was on the evening of 28/9/91 when the time changed." Article published in English on: 19-3-2009.